"Our Little Angel Has Her Wings"
In June of 2001, our lives were enriched by a beautiful little Yorkie in her retirement years. and began the journey of leaving numerous little footprints on our hearts. We could never have realized the wonderful adventure we were about to embark upon. From the first day she arrived, that winning personality was beyond anything we had ever known. that would win over even the most steadfast of proclaimed non-dog lovers. and ready to give her some well-deserved attention. petting her and telling her what a joy she was to have in your life. We often referred to Flair as our "Queen," for she truly had a majestic quality about her. that would make you stop whatever you were doing and observe her. Even when she greeted visitors at the door, she invited them inside with a manner befitting a refined socialite. you had to pet her and tell her about her beauty - this was her reward for being such a hospitable host. it was impossible not to be affected by the loving temperament of this beautiful creature. There was never a dog who could demand your attention just by her very presence like Flair could. and now you have the honour of being acknowledged and kissed by her. I could write pages, perhaps even a book, about how our lives were touched by this spectacular animal. Even then, I doubt I could relay all that is in my heart. we constantly remind ourselves of the gratitude we feel for having had her as part of our lives. Even in our darkest hours, Flair was a reminder of all that is good in this world. 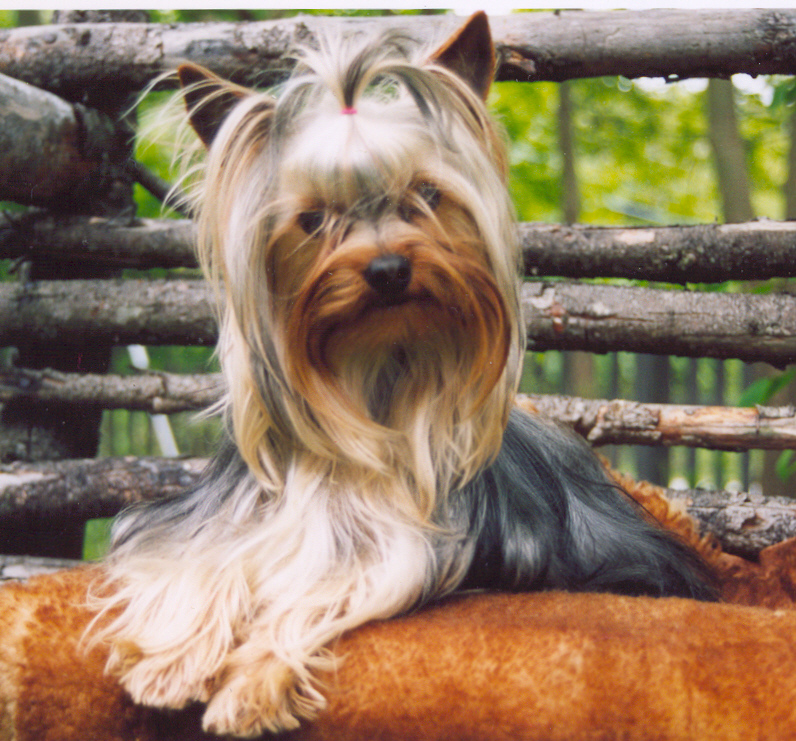 most importantly, unconditional love brought to life in the body of a little Yorkshire Terrier. And, for each tear we shed since her passing, a complementing smile also arises. who was so deserving of all the care and attention we bestowed upon her. and forever we will kiss you good morning and good night. Your little mother of pearl urn sits next to your picture and we will always adorn it with love. Not even your absence will remove you from our hearts, our minds and our souls. Our little angel has her wings. We know because we cried. We'll all miss you, Reno. the dog that started Barry down the path of showing and breeding. For Barry, life will never be the same. He says, with tears, "it's like something inside of him died." His family lost a happy, dedicated, loving pet. .....He has lost his best friend. At just over 11 years old, Molly (aka Mol Mol) passed peacefully away in her mom's arms. Thank-you, Linda Dahn, for entrusting us with three exquisite Aero dogs, Bailey, Jasper, and Cruise. We hope to do you proud. 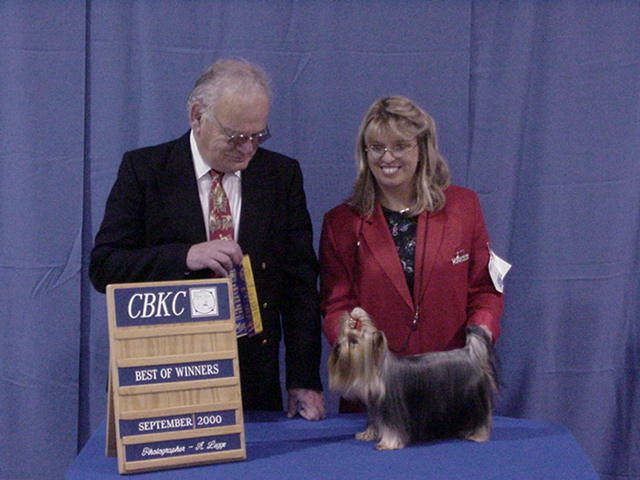 Fergie was bred by Linda Dahn (Aero Yorkies) in British Columbia. When she was 8 yrs old, Fergie and her daughter made the long flight here from BC to go to a new home here in Newfoundland. We were really just picking up the dogs and placing them with the new owners, as a favor to our good friend, Linda. The new home didn't work out. Rather than send them all the way back to BC, we looked for another home here in Newfoundland. Unfortunately, we couldn't find someone to take both the mom and daughter together. 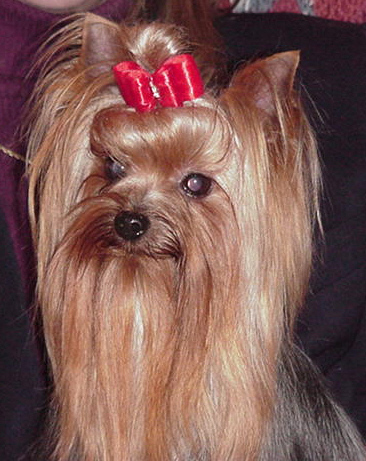 At around the same time, our beloved yorkie, Sapphire, passed away. Fergie somehow worked her way into Preston's heart and he decided he just couldn't live without her. Fergie was with us ever since. She slept on my pillow every night and although she was almost 15 yrs old, she still acted like a puppy and demanded to get her own way. If she wanted to get a drink of water at night or if she wanted to go potty, she would scratch at my head until I woke up. And if that doesn't work, she would proceed to try and wake up Preston. Finally, if all else failed, she would toddle over to the doggy stairs that we have next to our bed and walk down the stairs herself. She was so funny!Life will never be same without our "Ferg the werg". On February 18/10, we lost Fergie who was very dear to our hearts. This 15 yr old gal just went to sleep, and didn't wake up. sharing Preston's pillow or my pillow each and every night. For the next 7 years, she was treated like the queen that she was. She enjoyed many trips 'around the bay' to our summer home. a batch of ground beef,sweet potato, pasta or rice,baby spinich,green peas, etc. especially for her, because she loved it sooooooooooo much. Her favorite treat was to share plain potato chips with me, as we watched TV in bed at night. In the end, Fergie was deaf, and her eyesight began failing her. But that didn't stop her from doing all the things she loved, like sleeping in bed with us. She could still walk up and down the doggy stairs to the bed, and never missed the pee pee pad.